The Heddings surname is one of Angle/Saxon origin and it's historical trail has emerged from the mists of time to become an influential surname of the middle ages and of the present day. In an in-depth research of such ancient manuscripts as the Domesday Book compiled in 1086 A.D., by Duke William of Normandy, the Ragman Rolls (1291-1296) collected by King Edward 1st of England, the Curia Regis Rolls, The Pipe Rolls, the Hearth Rolls, parish registers, baptismals, Tax records and other ancient documents, research has the first record of the name Heddings in Nottinghamshire and Yorkshire, where evidence suggests they were seated before the Norman Conquest. Many different spellings are found in the archives. Although the name,Heddings occurred in many manuscripts, from time to time the surname was also spelt Heading, Headings, Headen, Headon, Hedding, Heddon, Heddon, Hedon, Hedin, Hedden, Heddin and these changes in spelling frequently occurred, even between father and son. There is one record, a father and eight sons. In the graveyard where they are buried, all nine have different spellings of their surnames. Many reasons were revealed for these spelling variations, but mainly church officials and scribes spelt the name as it was told to them. 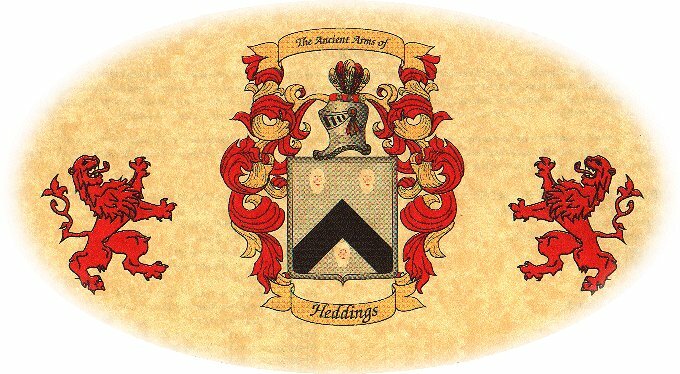 The family name Heddings emerged as a notable English family name in the country of Nottingham, where the parish of Headen is registered in the Domesday Book as King's land. And in Yorkshire, where the borough of Hedon was part of the lordship of Holderness granted by William the Conqueror to the Court of Aumale. In Nottinghamshire the landholders Gerard and Symon de Hedon were registered in 1273. These two men were either brothers or father and son and were the scions of the respective branches of the family name. Willelmus de Hedon was registered in 1379. By the 17th century a branch of the family was established in Scotland for Alexander Hedding was registered in Ponderualls in 1690. Notable amongst the family at the time was Gerard de Hedon of Nottinghamshire, a prominent landowner during the reign of Edward 1st. In Ireland, settlers become know as the Adventurers seeking land in Ireland. Called "undertakers" they undertook to maintain the Protestant faith. In Ireland the Headon family settled in the county of Wexford, but now the name is very rare. Principal amongst the settlers which could be considered a kinsman of the surname Heddings, or a variable spelling of that family name was Sarah Heading, who sailed to Barbados in 1659, Richard Hedon to New England in 1684, William Heddon to Georgia in 1753. E. Hedding to New York at the age of 70 in 1823, Mary Hedin to New York in 1835, John Heden to Philadelphia, PA in 1842 and Bernard Headon to Philadelphia PA in 1850. 20th century notables of the surname Heddings, include persons, such as Paul Arthur Hedin, American chemist, Alfred John Hedden American savings and loan executive and Kenneth Frederick Heddon, Canadian oil executive.